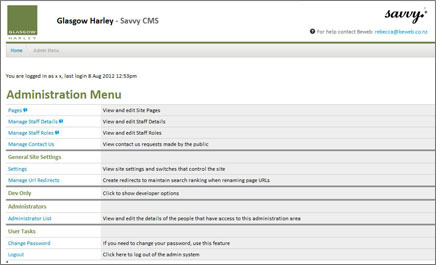 Savvy CMS is a simple, easy to use content management system that we tailor to meet the individual requirements of each website we work on. Our clients need a robust, fully customisable, rapidly deployable solution that works with their designs. Many clients ask us to rebuild their sites with Savvy CMS after finding other content management systems too hard to use, too restrictive and too expensive to maintain. We've helped clients switch from Umbraco, Dot Net Nuke, ICE CMS, and several other systems. By including a content management system (CMS) in your site, key staff (who may be completely non-technical) can easily keep your site up-to-date. Savvy allows users to take control of their content, providing the appropriate level of flexibility and ensures content follows the styles set up by the web designer. Over the past 13 years we have developed and continually innovated on a series of different features that can be implemented for any site. We also have the flexibility to develop totally new and custom elements, as our CMS is developed in-house and is completely extensible. Here is a small selection of features that we have included in our clients' Content Management Systems. Savvy is a cost effective system because you pay for only what you need, rather than paying for features that you do not want. Similar projects can take several times longer to implement using other content management systems, increasing cost, complexity and time to market. Savvy CMS follows the open source model with the product being free and the customisation time being all you pay for. 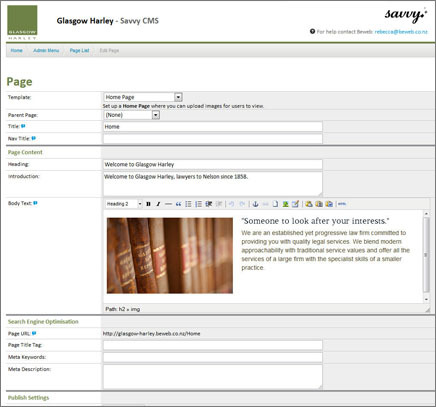 We implement Savvy CMS for each client so that the system works for your design, your content and your processes. Instead of trying to fit your content into our system, we work the other way around, analysing your content and developing the system around that. Other content management systems require you to re-orient your thinking to fit their model. Savvy allows users to edit and format the text, including headings, bold and italic, and upload images and multiple documents (PDF, Powerpoint, Word and Excel) per page, where appropriate. It is designed to be simple to use, requiring very little or no training. Text can be pasted in from Microsoft Word (or any other program) and the basic formatting is retained, but the fonts and colours are automatically changed to fit the website style. Savvy CMS is developed on the Microsoft .NET platform, which is fast becoming the prefered choice for enterprise level web applications. We use the Microsoft ASP.NET MVC 2 framework, which is based on the very popular MVC architecture for developing modern web applications. We typically use Microsoft SQL Server databases. Savvy CMS is released as Open Source under an MIT license. We receive community contributions and provide support to encourage developers to use our framework for their own projects. Please contact us for access details. We provide full source code of the entire project (at no extra charge) to give our clients peace of mind regarding their investment. The code is developed using standard Microsoft ASP.NET MVC code and our license terms allow you to take over development in future should you so wish. In addition the CMS is licensed free of charge, with you paying for customisation time only. This provides the advantages of an open source CMS, and with the bonus that we have written all the code ourselves so can make any modifications necessary and can provide full support. With the plethora of CMS products available, both open source and commercial, it is difficult to tell one apart from another. One feature clients often request is local support and preferably a CMS which is developed in New Zealand. When you deal with beweb you are dealing with the actual developers of the CMS, and there is nothing we can't make it do. We have been working with beweb since 2005 and have found them to be very responsive and insightful in the development of our bespoke systems and BI tools. We love their agile approach to programming as it fits in well with our culture and we have built a number of very elaborate tools in a short space of time this way.